Ok, who else has been to see this show? My mom and went to the Fox on Tuesday night because my aunt was kind enough to get us free tickets. 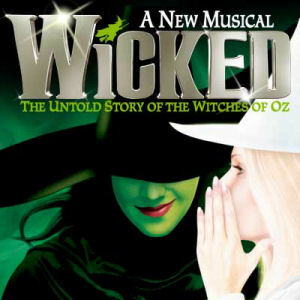 I've never been a huge fan of musicals (despite seeing quite a few of them) but the music to Wicked always catches my attention when they air commercials on the radio. I have not read the book and shockingly enough (no one is going to believe me) I have never seen The Wizard of Oz. Yes, I know that is very weird and almost impossible to imagine but I can say that it had no bearing on my understanding the storyline. While I really did enjoy the show I have a few things to say about it/the experience. 1. Why do those actors and actresses have to sing SO LOUD? I know that I was in the first couple of rows but I am pretty sure that they could be heard in the next county. I mean, take it down a notch and the audience might actually be able to understand what you are saying ALL the time. Maybe I just have sensitive ears but I found myself on more than one occasion discreetly plugging my ears because I was fairly certain my ear drums were about to rupture. I know that I could NOT have been the only one. 3. This is a legitimate question here. I'm not being ugly. Who buys t'shirts and souvenirs from these shows? And why? There were people there toting around SHOPPING BAGS full of Wicked paraphernalia. The only thing inside the Fox that I had the urge to purchase was alcohol and perhaps a pair of ear plugs, had they been available, to dampen the decibels a bit. 4. During the curtain call and while everyone was giving the actors/actresses a standing ovation for a great performance, the man that actually played the Wizard of Oz hushed and silenced all the clapping and cheering to give a speech about an AIDS charity they would be collecting money for after the show. Look, I love a good cause but these seats were $156 a piece and I can't imagine people enjoyed being hit up for cash on the way out the door after an already expensive evening. I'm just saying. I went out the side door. 5. Finally, if no one has ever warned you, you will freeze nearly to death inside the Fox if you do not come prepared for the arctic. Fortunately, I've made that mistake before and it will never happen again. Yes, I have to admit, I have probably been hiding out a bit over the past week. It's never fun to admit that you failed at something even when that something was probably entirely out of your control in the first place. Our big reunion with the Fatherland was a giant bust and Evans and I returned only a week after we started there. There isn't a whole lot to say about it besides the fact that I'm obviously very disappointed about it. I had high expectations and as it turns out, I probably shouldn't have. I've debated with myself off and on about whether I really knew this in my heart all along and I think that the bottom line is that I just wanted things to work out so badly that I was willing to go to any length in order for that to happen. And now I know that I have done my best. I'm having a hard time coming to terms with this entire situation being out of my control but for now, there is nothing left to do but try and move on. I don't want to but I think it's time to close this chapter of my life. That all being said, I'll be with Evans in Atlanta in the coming months and I'm trying to look forward to the many good things to come. I probably won't have many mentions of Deaner on here but when there is news, I'll try and share. Evans and I made the trek back to Atlanta last Wednesday. Ten hours is a long time on an airplane with a 13 month old. On the way to Germany the German lady on the aisle leaned over before take off and said, "he doesn't cry, does he"? Hmmmm, that's an interesting question lady, what do you think? If you had to guess, would you THINK that a 13 month old cried? I responded that he wasn't crying right this second but she would probably know if he did. Luckily on the return flight we were in a row of two by ourselves and Evans spent 3 hours sleeping and 7 hours playing quietly by himself in his seat. I'm never been so astounded in my life. I mean, Evans is always good but this was exceptional. Since we were only gone for a week he didn't have much trouble jet lag and he has made the adjustment well. Today I decided that it was about time for my child to own a pair of shoes. That's right, he has really never worn shoes and being as big as he is, it's a little redneck for us to be going everywhere barefoot at this point. Not that he can walk or really needs shoes but it is almost October and will eventually have to wear something on his feet. Above is a picture of E with his new red Keds! We also got navy blue. Evans was really into the shoe store and I think he is proud of his new shoes! My mom and I have always thought the guy that works there is a little bit creepy but Evans could not stop laughing at him and he CRIED when we left. I, on the other hand, almost cried when I found out what kids Keds cost. I feel nearly certain that I have never owned a pair that cost $30 like these and that I was able to wear them much longer than the projected three months. Geez. Didn't they used to cost like $8? Maybe I don't remember correctly. It has been awhile! As if I needed to spend more money on E we then headed to Richard's Variety Store (the name is a bit ironic, no?) and picked up a couple new Thomas trains. After nap time (which I hope lasts for A LOT longer) I have a feeling I know what we will be playing with. I'll try and have some more exciting stories for tomorrow but y'all know how it goes. Just trying to get back into the swing of things and settle in. There's no place like home, right? Stay tuned for my very mixed review on Wicked, which my mom and I saw last night at the Fox! Today my mom and sister and I had the honor of dining with our bestest oldest friends in Atlanta. It was a bon voyage of sorts since Evans I will be on the 4:25pm flight to Frankfurt tomorrow afternoon somewhat surprisingly. I have been keeping it under wraps on the off chance that I changed my mind but I think that for now, we are all systems go. We had aunties and grannies and counsins and uncles and Grandmags and Old Dads stopping by over the past two days to bid their grandson, nephew, cousin farewell. They might have wanted to wish me luck and tell me that they will miss me too but it has really mainly been about Evans. We are giving the fatherland one more shot and this time we will try and do it the right way. The end game goal is to feel something like this. And I am praying that we get there. I know that it won't be easy but I know that I want to put my best effort in and see what happens. All prayers and support is much appreciated and I will try and start updating on a more regular basis now that my life is going to be a quarter as social as it has been the past 6 months. Get ready Germany, we are coming home! Recently a very close friend of my sister's gave birth to her second beautiful son. After a completely normal and relatively uneventful pregnancy Davis James entered the world on July 20, 2011 and was met by two loving parents and one excited big brother. 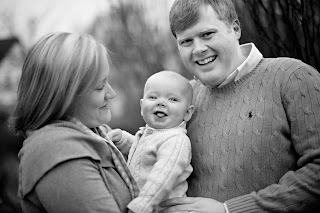 A few days later (and I can only imagine how long these days must have felt to the Kohl's) Davis was diagnosed with Trisomy 21 or Down's Syndrome and the entire course of their lives changed. While Davis is doing fantastic and meeting all his growth milestones he will still have open heart surgery somewhere around the time of turning four months old. I think about him more often than I don't and pray that everything will go smoothly in the coming months. As a parent I cannot even imagine what Stephani and Jared are going through in terms of caring for Davis, worrying about Davis and just being plain scared. I worry when Evans does something pretty normal like throw up so I know that I would be a total wreck if I knew that he was facing open heart surgery. Even from my limited interaction with the Kohls (I mainly get updates through my sister) I know that they are handling the situation dealt to them with strength and grace. Everyone take note, more parents could stand to be like them in the world and Jackson and Davis are two lucky little boys. The point of this post is that Stephani's sister, Chelsea, has come up with a really neat idea to help raise funds to ensure Davis' medical care is top notch. She has designed the above bracelet which is featured on her Etsy Shop online. The hyperlink should take you to her webpage where you can read more about Davis' story and more about her mission to raise funds. The bracelets are really fun and anyone would enjoy having one. You can choose your own words and it can be anything that is meaningful to you. I wanted to order one that would remind me of Davis so that I could remember to send up some special prayers for him and I also wanted to be reminded about how blessed I am to have my son in my life. 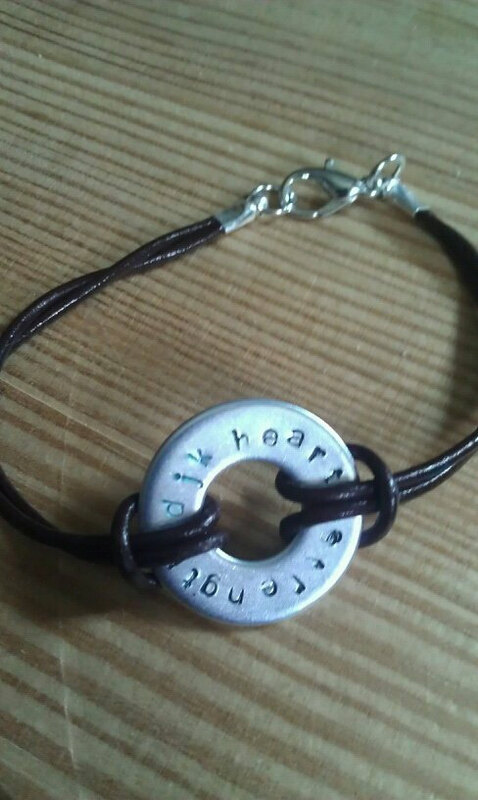 My bracelet will be engraved with "evans deaner" on one side and "djk" on the other side. If you are a mother of multiple children you could have all your children's initials put on the bracelet so that they were constantly close to you. I just really like the idea. When Evans was born my mom gave me a sterling necklace with a pearl disk and two silver disks engraved one with an "R" and one with an "E" for Evans. I really liked wearing my two boys initials around my neck and feeling like they were always with me. Then of course I leaned over the carseat one day to get Evans out and my necklace got caught on the seat and broke but that is besides the point! Check out Chelsea's Store HEREand help support a great cause. 100% of proceeds go to Gigi's Playhouse in Atlanta where Davis will be receiving physical and occupational therapy. You can't pick a better cause and you get an awesome bracelet out of it! I can't wait to see mine when it is done!! Does anyone remember reading this book as a child? 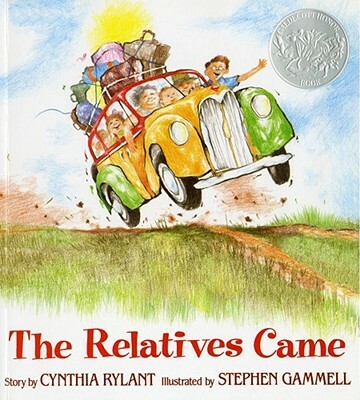 I certainly do and while Evans and I were the relatives that were doing visiting this weekend, I found myself thinking of this book from my childhood quite often. It has been many years since I read it but I remember the story of the rainbow colored station wagon (which was actually a black suburban this weekend to fit the entire herd of children) and the anticipation of the relatives arriving. Evans and I flew to North Carolina last Thursday to visit my sister-in-law, brother-in-law and the wild ruffian niece and nephews. Let me tell you, these trips are never dull, Evans doesn't sleep AT ALL and typically the two youngest require a midday bath. This trip was no different. We arrived home last night (Tuesday) and Evans slept about 18 out of the last 24 hours. The cousins just take it straight out of him. And he enjoys every minute. 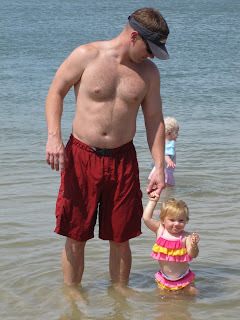 I thoroughly enjoyed myself and picked up several new flying tips for traveling with a one year old. Please stay tuned. After arriving on Thursday afternoon I promise that Evans and Karis needed a bath within one hour of being around each other. It was about 8 million degrees outside, around 98734 Popsicles were consumed, Karis ate a piece of bark and Evans ate a stick. Keeping in form and following all the guidelines of having a trailer park child, I removed Evans' pants and let him crawl around in the dirt with a white onesie. I have never seen feet so black. I promise that there was dirt left on the bottom of the bathtub that evening. Brittany and I had plans on Thursday evening to relax and enjoy some margaritas with a couple of her friends at their favorite (only) Mexican restaurant. Imagine our disappointment with our babysitter never showed up. We did the only thing reasonable in a situation like this and called the 8 year old boy down the street (ok, so he was really like 15 but he weighed as much as an 8 year old) to come down and watch all FOUR of our children. I really fooled myself into believing that Evans would stay asleep in his oh-so-comfy pack 'n play while I was gone but I made the babysitter promise to call me if he woke up. I arrived home to find Evans playing with his two older cousins. This started the "trend" of sleeping in the bed with Mommy that lasted the next four nights in a row. Friday we loaded up the kids to head to the beach around 11:30am and actually arrived there around 3:30pm. You might wonder why we picked a beach to spend the day at that was 4 hours away but the truth is that between stopping for lunch at Chick-fil-a and missing the entrance multiple times to the public beach access, this normally 30 minute drive was stretched out a tad. Things like this tend to happen to us. Once we unloaded everyone and set up post on the beach, we were met with an entire school of sharks in the water and had to cut our visit a little short. But don't worry, not before Evans and Karis managed to cover every inch of their bodies (and ours) with sand and have a great time. My brother-in-laws parents arrived on Friday afternoon (everyone was coming in town to celebrate my niece's first birthday) and we dined on margaritas at the mexican restaurant again much to Brittany and my's great pleasure! Saturday morning was another early morning for me as Evans was wide awake to play with the cousins when the sun started to come up but it was a good thing because as it turned out, we needed to plan Karis' whole birthday party that was to be taking place in a matter of 7 or so hours. I'm pretty sure my sister in law WOULD have made fondant cupcake toppers like I did if it weren't for that pesky little hurricane named Irene that just about blew their house away. For last minute planning (seriously, she mailed the invitations on THURSDAY, two days before the party) the party was a total success! The neighborhood clubhouse looked really cute.... all the kids had a great time swimming and taking turns at the pinata..... And Karis really LOVED everyone singing happy birthday to her on her big day! Both Evans and Karis got to spend some quality time with their Gannie and their Old Gannie at the party (these relatives arrived on Saturday morning). The party was a success minus a small crisis with the low country boil (the actual boiling part) and the pathetic performance by the Georgia Bulldogs that evening and Evans even slept in the pack 'n play for about 4 whole hours before getting in bed with me! Sunday was a low key day that included church, lots of porch sitting, lots of tree stump pulling, several naps by my child (he was really starting to feel the hurt by Sunday and approximately 96 hours with the cousins). The entire family had a fun dinner at Outback (only a 30 minute hop skip and a jump away), kids were well behaved for the most part and it was an enjoyable evening. Monday morning all the rest of the relatives had to head home. The weather was dreary but we took our chances and loaded the kids, boat and dog up for a trip to the beach. This time it only took us 30 minutes to get there! 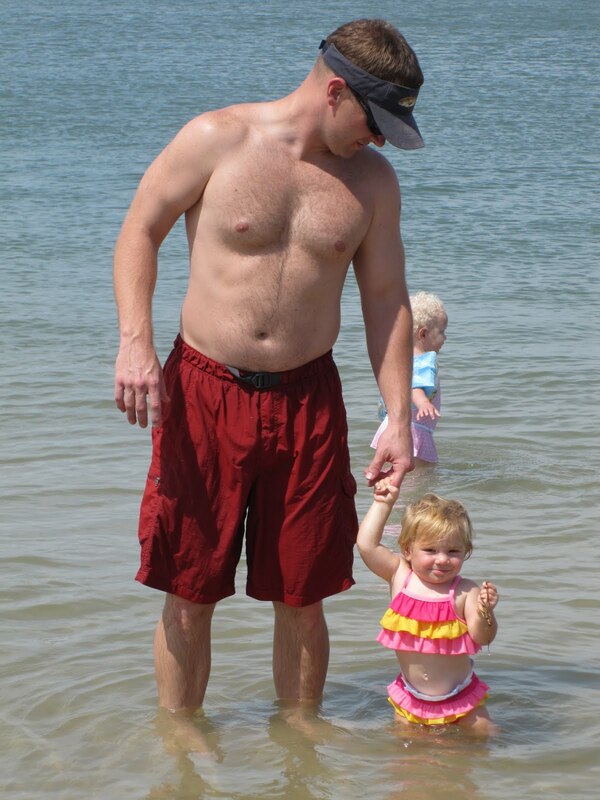 After a quick boat ride we were on this awesome beach and Evans and Karis both had a great time. You might not be able to tell by this picture because Evans can hardly open his eyes it was so bright. I guess I should have brought him his hat. Might have kept the sunburn off his scalp as well! The beach really was perfect and Evans loved his first time swimming in the ocean and was so pooped by the end of the day he conked out on me in a beach chair. Everyone enjoyed being outside and in the sun including Mark and Karis. (you see that Evans? Karis is standing. It is what you do with your feet). You know it was a big day when Evans, Karis and my nephew Colson (he is 6) share a large cheese pizza from Little Ceasars when we got home and ate everything except for one piece. My nephew Kyle couldn't help them out because he collapsed in the driveway on the way from the car into the house and was asleep on the concrete before anyone noticed it. Tuesday was the big departure day. Britt made us go to the gym in the morning and held a gun to my head and made me take the spin class she was teaching. :) It was actually great (I do like spin) and the kids got to stay in the nursery (even better). After lunch we headed to the airport. By this time Evans was particularly cranky without having a nap. I was greeted by the ticket counter agent and informed that the weather in Charlotte (where we had to connect) was horrible and our plane may or may not take off. Great. We were already flying on a prop plane that was a bumpy ride on the way up in perfectly clear weather. Miraculously the flight showed up and we were able to board only about 15 minutes late. Note to self, when you are aware ahead of time (as I was) that you will be boarding a prop plane directly on the tarmac, it would be smart not to wear a dress. I'm just saying. It would cut down immensely on the need to hold the dress between your knees while you collapse strollers etc. Evans was HORRIBLE upon boarding the plane and since there was NO AC, we were both sweating profusely and he was wailing. People were turning around and looking at me. I wanted to die. Then we took off and he promptly fell asleep. All good news. Then the weirdness starts. As I was about to doze off myself I was startled and shocked when I was splashed in the face by a steady stream of freezing cold water that continued to pour down from the overheard compartment and drench me and my child's head. Water was dripping off of Evans' eyelashes though thankfully after his initial jerk, he never woke up. I had to page the flight attendant and tell her that some sort of unidentified liquid had just soaked me. As she ran off to get me some napkins she was explaining that the "drip" must just be from the air conditioner condensation and she proceeded to dab a portion of the ceiling above me that was about 12 inches from where the deluge hit me. Hello? I'm not an idiot! That was not condensation! It was a downpour! I explained it came from the overheard and this lady completely ignored me as she explained again that it was just a drop of condensation. Pretty big drop if you ask me. The rest of the flight was uneventful and Evans slept on our connecting flight to Atlanta. We got home in time for me to pick up my fantasy football draft in the third round, but not before my smart brother drafted Peyton Manning, who was listed as out for half the season as of this morning. Awesome. All in all our little mini vacation was chaotic and super fun. I always have fun with my sister in law and I miss her when I can't see her very often. She makes me feel loved and I can only hope that I am half as good of a sister to her as she is to me. The Relatives Came ends with "when they finally had to leave, they were sad, but not for long. They all knew they would be together next summer" and the best part is, we don't even have to wait that long. Four more months until Christmas! Get ready for GAS LAMP! I love y'all.